THE WICKED WORKINGS OF YOU KNOW WHO! Ozian: Glinda! Exactly how dead is she? Glinda: Well, there has been much rumor and speculation... innuendo, outuendo... but let me set the record straight. According to the Time Dragon Clock, the melting occurred at the 13th hour; a direct result of a bucket of water thrown by a female child. Yes, the Wicked Witch of the West is dead! NO ONE CRIES THEY WON'T RETURN! NO ONE LAYS A LILY ON THEIR GRAVE! THROUGH THEIR LIVES OUR CHILDREN LEARN! WHAT WE MISS WHEN WE MISBEHAVE! Ozian: Glinda, why does wickedness happen? Glinda: That's a good question; one that many people find confusifying. Are people born wicked, or do they have wickedness thrust upon them? After all, she had a childhood,; She had a father, who just happed to be the governor of munchlinkland Witch's Parents Enter. Frex: I'm off to the assembly, dear. WHILE I'M OUT OF YOUR SIGHT! Frex Exits. A Lover Runs Into The Room. Glinda: And like all families, they had their secrets. Glinda: And of course, from the moment she was born she was... well... different! Melena: What is it? What's wrong? Frex: Take it away... Take it away!!!! Glinda: So you see, it couldn't have been easy! NOW AT LAST THERE'S JOY THROUGHOUT THE LAND! WHO SPURN WHAT GOODNESSES THEY ARE SHOWN! Ozian: Glinda, is it true you were her friend? Glinda: Well, I... you see... um... yes. Glinda: Well, it depends on what you mean by "friend". She Motions Her Bubble Downward. I did know her. That is, our paths did cross... at school. But you must understand, it was a long time ago and we were both very young. Scene Fades As Shiz Students Appear. Elphaba Enters With Them. THE PROUDLIEST SITE THERE IS. Galinda: Being Wheeled In On A Big Cart Filled With Luggage. Frex Wheels Nessarose On Stage. Elphaba: What?! What are you looking at? Oh, do I have something in my teeth? Okay, let's get this over with. No, I'm not seasick, yes, I've always been green, no, I didn't chew grass as a child. Elphaba: Oh, this is my younger sister, Nessarose. As you can see, she is a perfectly normal color. Elphaba: Yes, I know, to look after Nessarose. Frex Holds Out A Box. Frex: My precious little girl: a parting gift. Nessarose: Now, father... He Pulls Silver Shoes From The Box. Jeweled shoes! Frex: As befits the future governor of Munchkinland. Elphaba, take care of your sister. And try not to talk so much! He Kisses Nessarose And Exits. Elphaba: Well what could he have gotten me? I clash with everything! Elphaba & Galinda Raise Their Hands. She Notices Galinda First. Yes, is this regarding room assignments? But you can all come visit me whenever you want! Shen Shen: How good of you! Pfanee: You are so good! Galinda: Now stop! Swishes Her Hair. Morrible: Do you have a question? Galinda: Yes, you see, I am Galinda Upland of the Upperuplands... I've applied to your sorcery seminar, and indeed that is my sole purpose of attending Shiz; to study sorcery with you. Perhaps you recall my essay, "Magic Wands, Need They Have A Point". Morrible: Yes... However, I do not teach my seminar every semester, unless, of course, somebody special were to come along. Elphaba: We have not yet received our room assignments. Morrible: Yes, yes, of course! Oh, You must be Miss Nessarose, the governor's daughter. What a tragically beautiful face you have! Sees Elphaba, snorts...And you must be. Elphaba: I'm the other daughter. Elphaba. I'm beautifully tragic. Morrible: Yes, yes, I'm sure you're very bright. Morrible: I don't seem to have you on my list. Oh, well a slight gulch, but not to fret! We'll find someplace to put you. Galinda: Y'know, I don't even think she read my essay. Shen Shen: That's so unfair! Boq: You should say something! Morrible: Now, which one of you young ladies would like to volunteer to share with Miss Elphaba? Morrible: Thank you dear. Oh, how very good of you! Morrible: Miss Elphaba, you may share with Miss Galinda. Elphaba: But Madame, I've always looked after my sister. Morrible: Everyone, to your dormitories. Nessarose's Wheelchair Is Torn From Morrible's Hands And Begins To Wheel Itself Back To Elphaba. Morrible: How did you do that? Galinda: How did she do that? Morrible: You mean this has happened before? Elphaba: Uh... Something just comes over me sometimes... I'm sorry, Madame. Morrible: What? Never apologize for talent! Talent is a gift! Have you ever considered a career in sorcery? Morrible: I shall tutor you myself, and take no other students. All Students But Galinda Exit. Morrible: No, not now dearest. Glinda: This will just make me a better person. OR LIKE MUNCHKINS SO SMALL-MINDED? NO! I'D BE SO HAPPY I COULD MELT! HELD IN SUCH HIGH ESTEEM! I FELT THE MOMENT I LAID EYES ON YOU! HOW DO YOU STAND IT, I DON'T THINK I COULD! BUT GALINDA, YOU'RE A MARTAR! Both: WHAT IS THIS FEELING SO SUDDEN AND NEW? Students: WE LOATHE IT ALL! Both: OH WHAT IS THIS FEELING? Both: DOES IT HAVE A NAME? Both: IT'S SO PURE, IT'S SO STRONG!!! Students: LOATHING................... LOATHING....... LOATHING YOU! Both: LOATHING, TRULY, DEEPLY LOATHING YOU! Students: ............................ LOATHING, UNADULTERATED LOATHING!!! Both: MY WHOLE LIFE LONG!!!! The Students Are In Desks As Dillamond Arrives. Dillamond: Settle down, now! I have read your most recent essays. And I am amazed to report the progress! Although, some of us still tend to favor form over content... Ms. Glinda. Galinda: I really don't see what the problem is. Every other professor seems to be able to pronounce my name. Elphaba: Maybe pronouncing your precious name isn't the sole purpose of Doctor Dillamond's life. Maybe he's not like every other professor. Maybe some of us are different. Galinda: Oh! It seems the artichoke is steamed. Dillamond: Class, class! Miss Elphaba has a point! As you know, I am the sole Animal on the faculty. The token Goat, as it were. But it wasn't always this way. Oh, dear students, how I wish you could have seen it as it once was. Where you could walk down the halls and see an antelope explicating a sonnet, a snow leopard solving an equation, a wildebeast waxing philosophic. Don't you see, dear students, how our dear Oz is becoming less and less...looks at Elphaba... colorful. Now, who can tell me what sent these events into motion? Elphaba: Raises hand From what I've heard, it all started with the great drought. Galinda: It's GAlinda... with a GA. I don't see why you can't just teach us history instead of always harping on the past. Walks Over To The Chalk Board And Turns It Over. On it is written: ANIMALS SHOULD BE SEEN AND NOT HEARD. Who is responsible for this? I'm waiting for answer... Very well, that will be all for today... You heard me, class dismissed!!! All Students Exit Except Elphaba & Nessarose. Dillamond Has His Back Turned To Her. Elphaba: You go on ahead, Nessa. Elphaba: Reading The Board Aloud. "Animals should be seen and not heard..."
Dillamond: Oh, Miss Elphaba, don't worry about me, go along and enjoy your friends. Elphaba: Oh that's alright, I have no friends. Would you like to share my lunch? Dillamond: Oh, thank you! How kind. She Pulls Out A Candy Bar And Unwraps It. He Takes The Paper and Begins To Eat It. He Sees The Board. Dillamond: I seem to have lost my appetite. Elphaba: You shouldn't let statements like that bother you. I mean, I always do, but you shouldn't. WHO HAS LOST ALL POWERS OF SPEECH. Elphaba: Dr. Dillamond, are you alright? Shall I fetch you a glass of water? Dillamond: No, I don't know what came over me. Elphaba: So, you're saying that there are animals that have, somehow, forgotten how to speak? But, how is that possible? Morrible: I heard there was some sort of disturburance in class. Are you alright, Doctor? Oh, Miss Elphaba, you're still here! I thought you would have been on your way to my seminar by now. Morrible: But what? I do hope I have not misplaced my trust in you. Magic is a very demanderating mistress, and if one has ambitions of meeting the Wizard. I'm sure Doctor Dillamond sees my point. Elphaba: I'd better go. Doctor Dillamond, if something bad is happening to the Animals then someone has to tell the Wizard. That's why we have a Wizard! Avaric: Here we are, sir! Shiz University! Avaric. Don't worry, I won't last longer at this school than I did at any of the others. Boq: Uh, miss Galinda, I know I'm just a munchkin, but munchkins have feelings too, and I've been trying to tell you mine, for you. But sometimes it seems like you don't even know I'm there. Galinda: That's not true, Biq. Galinda: Biq, do you know who that is? That's Fiyero Tiggular, tha Winkie Prince whose reputation is so scandalacious! Boq Looks Disgusted. Fiyero Walks Toward Them. Galinda Swishes Her Hair. Fiyero, Noticing Her Strange Behavior, Does The Same. Galinda: To Fiyero. Were you looking for something or someone? Fiyero: Uhhh yea... history... class? I don't know... somewhere? Galinda: That class just ended! Fiyero: Oh! Perfect timing! So, uh, what does one do for fun around here? Fiyero: Well, I see that once again the responsibility to corrupt my fellow students falls to me. Fortunately, I'm up for the task. BELIEVE ME, I'VE BEEN KICKED OUT OF ENOUGH OF THEM TO KNOW! BUT I SAY WHY INVITE STRESS IN? So! What's the most swankified place in town? Galinda: That would be the Ozdust Ballroom! IF ONLY BECAUSE DUST IS WHAT WE COME TO! Boq: Miss Galinda? I hope you'll save at least one dance for me. I'll be waiting right there, right by your side, waiting, all night. Galinda: Oh, how very kind, Biq. Galinda: But, do you know what would be even kinder? SEE THAT TRAGICALLY BEAUTIFUL GIRL? Boq: Well, maybe I could invite her! Boq: I would do anything for you, Miss Galinda. Fiyero: To Galinda. You're good. Fiyero: So, I'll be picking you up around eight? IT'S CLEAR WE DESERVE EACHOTHER! The Scene Fades To Elphaba and Nessarose. Elphaba: It's absurd! This silly, rich boy appears and everyone's off to worship him and some cultish social gathering! Nessarose: Don't you dare say another word against her! I'm about to have the first happy night of my life all thanks to Galinda! Please, Elphaba, try to understand. The Scene Changes To Galinda, Shen Shen, & Pfanee. Elphaba Remains On The Other Side Of The Stage. Galinda: Now I must accessorize myself for Fiyero. Shen Shen Pulls The Witch's Hat Out Of One Of Galinda's Hat Boxes. Pfanee: Galinda, what in Oz's name!? Galinda: Now, just pretend you didn't see that. My granny is always giving me the most hideodeous hats. I'd give it away, but I don't hate anyone that much. Shen Shen: Yes you do! Pfanee: Give it to her! Just do it! They All Stare At Elphaba. Galinda Walks Forward, Meeting Elphaba Half Way. Galinda: And I was just talking about you! I thought you might want to wear this hat to the party tonight! Gives Her The Hat. Y'KNOW BLACK, IS THIS YEAR'S PINK! YOU DESERVE EACHOTHER, SO HERE! OUT OF THE GOODNESS OF MY HEART! Galinda Runs Off. Elphaba Laughs At The Sight Of The Hat. She Exits.. The Students Enter And Dance. When This Is Done, Boq And Nessarose Appear, Awkwardly Holding Hands. Boq: Lemons, and melons, and pears! NOW, I KNOW IT ISN'T FAIR. Nessarose: Oh, Boq, I know why. AND WE DESERVE EACH OTHER, DON'T YOU SEE THIS IS OUR CHANCE? Boq: You know what? Let's dance! They Dance, As Well As The Others Around Them. Finally, Mme. Morrible Runs Up To Galinda. Galinda: Madame Morrible... What are you doing here? Morrible: I have something for you. She Hands Her A Small Wand. Galinda: Gasps. Madame... a training wand... How can I ever express my graditution? Morrible: Oh, don't thank me! This was your roommate's idea, not mine. Morrible: Miss Elphaba requested that I include you in sorcery class. She insisted I tell you this very night or she would quit the seminar. Morrible: I have no idea. My personal opinion is you do not have what it takes. I hope you'll prove me wrong... I doubt you will. She Leaves. Fiyero Comes Up To Galinda. Fiyero: Then what's the matter? They Begin To Dance As Elphaba Walks In. They Stop As All The Students Gasp And Make Comments About The Way She Is Dressed. People Then Start Laughing. Fiyero: Who in Oz is this? Galinda: My roommate... please, don't ... stare! Fiyero: How can you help it? Elphaba Takes Off The Hat, Noticing The Comments. She Waits, Then Puts It Back On And Begins To Dance. She Is Alone. There Is No Music. Fiyero: Well I'll say this, she doesn't give a twig about what anyone else thinks. Fiyero: Why? It's not like it's your fault. Galinda: Excuse me... She Walks Over To Elphaba and Clears Her Throat. May I cut in? Galinda Begins Dancing Just As Horribly. The Students Now Accept It, And Begin To Dance Again As The Music Starts. Elphaba & Galinda Barge Into Their Suite... Galinda Is In Hysterics. Galinda: Your very first party ever?! Your very first party! Oh I know! Let's tell each other something we've never told anyone... I'll go first: Fiyero and I are going to be married (squeals). Galinda: No, he doesn't know yet... Now, you tell me a secret. Galinda: Like... Why do you always sleep with this funny, little, green bottle under your pillow? Grabs The Bottle. Galinda: C'mon, tell me. Tell me tell me! Galinda: Hands Her The Bottle. It's not fair. I told you a really good one. Elphaba: My father hates me. Elphaba: So he made my mother chew milk flowers, day and night. But that made Nessa come too soon, with her little legs all tangled. And my mother never woke up. None of which ever would have happened if not for me. Galinda: But that was the milkflowers fault, not yours. That may be your secret, Elphaba, but that doesn't make it true. She Oh look, it's tomorrow! Elphie... do you mind if I call you Elphie? Elphaba: Well, it's a little perky. Galinda: And you can call me... Galinda. So... Elphie... now that we're friends, I've decided to make you my new project! THOUGH IT'S THE TOUGHEST CASE I'VE YET TO FACE! WE'RE GONNA MAKE YOU POPULAR! Elphaba: This is never going to work! Galinda: Oh Elphie, you mustn't think that way anymore! Your whole life is going to change... and all because of me. Okay, stand... I will turn your frock into a beautiful ball gown! Stand up... She Picks Up Her Wand And Waves It. Ball gown!!! Nothing Happens, So She Repeats. Ball gown!!! Still Nothing Happens. She Taps Her Wand On The Bed. Is this thing on? Elphaba: Do you want me to try? Galinda: No, I've got it! She Throws The Wand Down. Oh, just wear the frock... it's pretty! Now, I'll show you how to flip your hair: Flip flip. Or you could use your hand. Demonstrates. Or, you can use your whole body. Falls onto bed. Squeals. Now, for the finishing touch. Takes flower out of her hair, puts it into Elphaba's. Why, Miss Elphaba, look at you, you're beautiful. Hands her the mirror. Elphaba: After Looking In The Mirror. I... I have to go. Galinda: You're Welcome! She Admires Herself In The Mirror. The Students Are In Dr. Dillamond's Class In Desks. Elphaba Walks In Outrageously Dressed. Elphaba: Flips her hair.. Flip Flip! What? Fiyero: Nothing, it's just... you've been "Galinda-fied". You don't have to do that , you know? Dillamond: Alright, take your seats, class! I have something to say, and very little time to say it. This is my last day here at Shiz I am no longer permitted to teach. I want to thank you for your sharing your enthusiasm, your essays, no matter how feebly structured, and even, on occasion, your lunch. Morrible: Doctor Dillamond! I'm so dreadfully sorry. Elphaba: Madame, we've got to do something. Dillamond: Miss Elphaba, they can take away my job, but I shall continue speaking out. Two Men Begin To Carry Him Out Of The Room. Dillamond: They are not telling you the whole story! Remember that, class! Remember that. Elphaba: Doctor Dillamond! After A Pause. Well, are you just going to sit here in silence? Morrible: Miss Elphaba, there is nothing we can do. Please take your seat. Professor: Every day, with every tick of the Time Dragon Clock, in every corner of our great Oz, one hears the silence of progress. For example: this is called a cage! He Points To A Cage With A Cloth Draped Over It. He Pulls Off The Cloth, Revealing A Lion Cub Inside. Elphaba: If this is for his own good, then why is he trembling? Professor: He's just excited to be here, that's all. Hits the cage. Now, as I was saying, one of the benefits of caging a Lion cub while he's young is that he never, in fact, will learn how to speak. He Motions The Students Forward, Toward The Cage. Professor: That's right! Come closer! Elphaba: To Fiyero. Can you imagine a world where Animals are kept in cages and they never speak? Professor: Now, he may seem a bit agitated but that's easily remedied. Elphaba: What should I do? Elphaba: Well, somebody has to... Do something!!! Sparks Begin To Fly Everywhere. All Students & The Professor Are Moving Uncontrollably Except Fiyero and Elphaba. Fiyero: Alright just don't move! And don't get mad at me... He Grabs The Cage. Well are you coming? She Runs With Him After He Snatches The Lion Cub. Elphaba: Careful! Don't shake him! Fiyero: Don't you think that I realize that? You must think I'm really stupid or something! Elphaba: No, not really stupid. causing some sort of commotion? Elphaba: I don't cause commotions, I am one. Elphaba: Oh! So you think I should just keep my mouth shut! Is that what you're saying? Elphaba: Do you think I want to be this way? Do you think I want to care this much? Don't you know how much easier my life would be if I didn't? Fiyero: Do you ever let anyone else talk? Elphaba: Oh, sorry... But can I just say one more thing? You could have just walked away back there. Fiyero: Excuse me, there's no pretense here. I happen to be genuinely self-absorbed and deeply shallow. Elphaba: No you're not. Or you wouldn't be so unhappy. Fiyero: What did you mean to do? Why was I the only one you didn't do it to? Elphaba: Oh look, you're bleeding... it must have scratched you. Referring To A Cut On His Face. Fiyero: Yea... or maybe it scratched me. I better get to safety... I mean the cub... get the cub to safety. TO THE LAND OF "WHAT-MIGHT-HAVE-BEEN"
Morrible Enters. She Is Carrying An Umbrella And Holds It Over Elphaba To Protect Her From The Rain. Morrible: Miss Elphaba, there you are! Morrible: Oh Miss Elphaba, I finally heard back from the Wizard! Morrible: Yes, he wishes to meet you! Elphaba: He asked for me? Morrible: Yes! I know how devastated you were the other day for our poor Doctor Dillamond, but I can assure you my dear, as one door closes, another one opens. She Hands Her A Green Envelope. Elphaba: Madame, I don't know what to say! How can I ever thank you? She Hugs Her. She Places The Umbrella Back Over Elphaba's Head. Oh, I know! She Waves Her Hands And The Sun Comes Out. Didn't I tell you? Weather is my specialty. Oz-speed, my dear! Make me proud. Elphaba: I will, I'll try. The Scene Reopens At A Train Station. Galinda: Remember, eye contact. And don't forget to tell him how wonderful he is, Wizards love that! And be yourself... well... within reason. Nessarose: Elphaba, I'm so proud of you and I know father would be too. We're all proud, aren't we? Elphaba: You'll be alright, won't you? Galinda: She'll be fine! Biq will take care of her, right? Boq: ...It's Boq... I... I can't do this anymore. Galinda: Nessa, maybe he's just not the right one... for you. Nessarose: No, it's me that's not right. Elphaba, just go, I'll be fine. Galinda: Let her go. She'll have to manage without you. We all will. Elphaba: Please, you'll barely even notice I'm gone. Besides, you have Fiyero. Where is he, anyway? Not that I expected him to say goodbye to me. We barely know each other. Galinda: I don't know him either. He's distant, and moodified, and he's been thinking, which really worrries me. I never knew how much he card about that old goat. Galinda: Oh, there he is! Fiyero, over here dearest! Fiyero: He Hands Elphaba Flowers. Elphaba, I'm happy for you. Fiyero: About that Lion cub and... everything. I think about that day a lot. Elphaba: Really? So do I.
Galinda: Me too! Poor Doctor Dillamond. It makes one want to... uh... take a stand. So I've been thinking of... uh... changing my name. Galinda: Well, yes! Since Doctor Dillamond had his own way of pronouncing my name, in solidarity and to express my outrage, I will henceforward be known no longer as Galinda, but as simply, Glinda. Fiyero: Oh well, that's very admirable of you... Glinda. To Elphaba. Elphaba, good luck. Glinda: It's Glinda now. Stupid idea, I don't even know what made me say it. Elphaba: It doesn't matter what your name is, everyone loves you! Glinda: I don't care! I want him. I don't even think he's perfect anymore and I still want him. This must be what other people feel like. How do they bear it? Elphaba: To the Emerald City. Glinda: I've always wanted to see the Emerald City! ONE SHORT DAY, IN THE EMERALD CITY! BUT FOR TODAY WE'LL WANDER AND ENJOY! Ozmopolitan! Elphie... Elphie? C'mon we'll be late for WizOMania. Elphaba: I want to remember this moment, always. Nobody's pointing, nobody's staring, for the first time, I'm somewhere that I belong. Glinda: You look positively, emerald. The Stage Lights Dim & Wizomania (The Musical) Begins. SAILED IN TO SAVE OUR POSTERIORS? HAS ALL OF US HONEYMOONING? Chorus: WHO'S THE SAGE WHO SAGELY SAILED INTO SAVE OUR POSTERIORS? WHAT A WAY TO BE SEEING THE CITY! Ozian Official: The Wizard will see you now! Wizard: I am Oz, the great and terrible! Who are you and why do you seek me? Elphaba: Uh... Elphaba Thropp your terribleness! Wizard: Oh? Is that you Elphaba? I didn't realize! He Climbs Out Of The Head. Wizard: I hope I didn't startle you, it's so hard to make out peoples' faces all the way back there. So, let's see... which is which? Elphaba! He grabs her hands. And you must be. Glinda: Glinda. The Ga is silent. Elphaba touches the Oz mask. Wizard: I know. It isn't much, is it? But people expect this sort of thing. You have to give people what they want. The thing is, I hardly ever let people meet the real me, but this being special occasion. Elphaba: I'm so happy to meet you. Wizard: Well, that's good. 'Cause that's what I love best: making people happy! 'CUZ I THINK EVERYONE DESERVES THE CHANCE TO FLY! ALLOWS ME TO FEEL SO PARENTAL. Wizard: Please, I'm the Wizard of Oz. I already know why you've come. Glinda: Prove yourself, prove yourself. Wizard: Oh, I don't know. SOMETHING TO TEST YOUR ADEPTNESS.. I know! Madame, the book! Wizard: I believe you're well acquainted with my new Press Secretary. Morrible: Oh, yes dearies, I've risen up in the world. You'll find that the Wizard is a very generous man. If you do something for him, he'll do much for you. Elphaba: What do yhou want me to do? Glinda: Noticing A Book In Morrible's Hands. Is that the Grimmerie? Morrible: Yes, the ancient book of spells and enchantments. Glinda: Whispers. Can I touch it? Morrible: Well it's a lost language. The lost language of spells. Wizard: It's kind of a recipe book for change. Wizard: She Continues Chanting. Oh, Chistery, what a experience you are about to have! Elphaba: AH MAY AH TAH TAY MAY TU SE SAY TA! Wizard: I KNOW EVERYONE DESERVES THE CHANCE TO FLY! Chistery Screams & Begins To Twitch. Elphaba: What happened? Is something wrong? Morrible: No just a transition, dearie. Elphaba: No, stop you're hurting him! Wizard: She's actually done it! Chistery Sprouts Wings. And Begins Running Around The Stage. Elphaba: NO! Quick, how do I reverse it? Morrible: You can't! Spells are irreversible! I knew she had the power, I told you! Elphaba: You planned all this? Morrible: Well, you benefit too, dearie! You benefit, too. Wizard: And this is only the beginning! Look. The Other Monkeys Begin To Grow Wings And Fly. Morrible: Won't they make perfect spies? Wizard: You're right, that's a harsh word... how about scouts? That's what they'll be really. They'll fly around Oz! Report any subversive Animal activity. Elphaba: You can't read this book at all! Can you? That's why you need enemies, and cages, and spies. You have no real power. Wizard: Exactly... that's why I need you. Don't you see? The world is your oyster, now! You have so many...opportunites. You both do. Glinda: Thank you, your Ozness. Glinda: Elphie! I am so sorry, your Wizardship. I'll fetch her back! Elphie wait! Wizard: We must get her back. She knows too much. Morrible: Don't worry! I will handle it. He Gets Back In The Head. Speaking, Again, With A Powerful Voice. Wizard: Guards, guards! There is a fugitive loose in the palace! Find her, capture her, and bring her to me! Glinda: Elphie, wait! Where are you going? Elphaba: I have to barricade the door! She Picks Up A Broom And Places It Over A Trap Door. Glinda: Elphaba, why couldn't you have stayed calm for once instead of flying off the handle? Morrible: Citizens of Oz, there is an enemy that must be found and captured! Believe nothing she says. She's evil. Responsible for the mutilation of these poor, innocent monkeys! Her green skin is but an outward manifestation of her twisted nature! This distortion... this repulsion... this... Wicked Witch!!!!!!!!!!!!! The Scene Fades To Elphaba & Glinda. Elphaba: I'm not... it's the Wizard who should be afraid... of me! Glinda: Elphie, just say you're sorry before it's too late. YOU'RE HAVING DELUSIONS OF GRANDURE? BUT 'TIL I TRY I'LL NEVER KNOW! The Guards Bang On The Locked Door. Guard: Open this door, in the name of his supreme Ozness! Glinda: As Elphaba Continues Chanting. What are you doing?! Stop it! That's what started all this in the first place... that hideous levitation spell! STOP!!! A Broomstick Floats Across The Room Towards Elphaba. Elphaba: I told you, Glinda... I did it, I tell ya! The Guards Bang On The Door Once Again. Elphaba: Come with me... think of what we could do... together. THEY'LL NEVER BRING US DOWN. She Drapes A Black Cape Around Her. I HOPE YOU'RE HAPPY IN THE END! Elphaba Runs Off. The Guards Break Down The Door. Guard: There she is! Don't let her get away! They Grab Hold Of Glinda. Glinda: What in Oz?! Let go of me! Do you hear me? Let go! Elphaba: It's not her. She has nothing to do with it. I'm the one you want. It's me. Hahahahaha. It's me! Up here! It's me! She Rises Up Center Stage Holding Her Broom. TELL THEM HOW I AM DEFYING GRAVITY!!! I'M FLYING HIGH DEFYING GRAVITY!!! Glinda, Fiyero and Morrible Appear Onstage On APodium. Glinda: Fellow Ozians, as terrifying as terror is, let us put aside our panic for this one day... and celebrate! OH WHAT A CELEBRATION WE'LL HAVE TODAY! LET'S HAVE A CELEBRATION THE GLINDA WAY! Morrible: And thank goodness for you, Glinda, and your handsome swain, our new captain of the guard. To Fiyero. Now you've been at the forefront of the hunt for the Wicked Witch, haven't you? Fiyero: Not really, but I don't like to think of her as a Wicked Witch. Morrible: Captain, how does it feel? Fiyero: Frustrating... but I became captain of the guard to find her, and I will keep searching! Fiyero: To Glinda - Confused. This is an engagement party? Glinda: Good, we hoped you'd be... the Wizard and I! Fiyero: That's not how you described it to me. Glinda: Oh no, not exactly, but Whispers we'll talk about it later. Gasps From Among The Crowd. I HEAR SHE HAS AN EXTRA EYE THAT ALWAYS REMAINS AWAKE! I HEAR THAT SHE CAN SHED HER SKIN AS EASILY AS A SNAKE! I HEAR SOME REBEL ANIMALS ARE GIVING HER FOOD AND SHELTER! I HEAR HER SOUL IS SO UNCLEAN, PURE WATER CAN MELT HER! MELT HER! PLEASE SOMEBODY GO AND MELT HER! Fiyero: Do you hear that?! Water will melt her? People are so empty-headed they'll believe anything! Glinda: Excuse me just a tick-tock! Her And Fiyero Talk Aside. Fiyero: I can't just stand here grinning pretending to go along with all of this! Glinda: Do you think I like to hear them say those awful things about her? I hate it! Fiyero: Then what are we doing here? Let's go, let's get out of here! Glinda: We can't leave now, not when people are looking to us to raise their spirits. Fiyero: You can't leave, because you can't resist this. And that is the truth. Glinda: Maybe I can't. Is that so wrong? Who could? Fiyero: You know who could. Who has. Glinda: Fiyero, I miss her too, but we can't just stop living. No one has searched harder for her than you. But don't you see? She doesn't want to be found. We have to face it. Fiyero: You're right. I'm sorry, you're right. And if it's going tol make you happy, of course I'll marry you. Glinda: But it'll make you happy too, right? Fiyero: You know me... I'm always happy. He Runs Off. Glinda: Fiyero! Thanks plenty dearest! He's gone to fetch me a refreshment, he's so thoughtful that way! THERE ARE BRIDGES YOU CROSSED YOU DIDN'T KNOW YOU CROSSED UNTIL YOU'VE CROSSED! WE LOVE YOU GLINDA IF WE MAY BE SO FRANK! FOR ALL THIS JOY WE KNOW WHO WE'VE GOT TO THANK! Glinda: I COULDN'T BE HAPPIER!!! Ozians: TODAY, THANK GOODNESS FOR TODAY! The Scene Opens At The Governer's House In Munchkinland. Boq: Will there be anything else, Madame? Nessarose: I've asked you to call me Nessarose, remember? Elphaba's Voice Is Heard Inside A Closet. Elphaba: Well, it seems the beautiful only get more beautiful, Nessarose Screams while the green just get greener. Nessarose Is Scared And Confused. Elphaba Steps Out Of The Closet. Elphaba: I'm sorry. Did I scare you? I seem to have that effect on people. It's good to see you. Nessarose: What are you doing here? Elphaba: Well, there's no place like home. I never thought I'd hear myself say this but I need father's help. I need him to stand with me. Elphaba: No, no it's not. Not if you ask him. You know he'll listen to you. Nessarose: He's dead. I'm the governor... Well what did you expect? After he learned what you'd done, how you'd disgraced u,s he died... of shame. Embarrassed to death. Elphaba: Good, I'm glad. It's better that way. Nessarose: That's a wicked thing to say. Nessarose: Elphaba, shut up! First of all, I can't harbor a fugitive, I'm an un-elected official! And why should I help you? You fly around Oz, trying to rescue animals you've never even met, and not once have you ever thought to use your powers to rescue me! AND THIS HIDEOUS CHAIR WITH WHEELS! Elphaba: Nessa, there isn't a spell for everything! The power is mysterious. It's not like coddling up a pair of... She Pulls Out The Grimmerie From Her Bag. Wait. Nessarose: What are you doing? Nessarose: What is that? Ah! My shoes! It feels like... like they're on fire! What have you done to my shoes??? She Lifts Her Dress, Revealing The Ruby Slippers. Nessarose Stands, But Falls. Elphaba Gives Her A Hand. Nessarose: No, don't help me. She Stands. Nessarose: Boq! Boq! Come quickly! Nessarose: Boq! Come here at once! Elphaba: No! Nessa, listen, nobody can know I'm here! Nessarose Runs Behind The Closet As Boq Enters. Boq: Yes, what is it, Madame? Boq: What are you doing here? You stay back! Elphaba: Boq, it's just me, I'm not going to hurt you! Boq: No! You're lying! That's all you ever do! You and your sister! She's as wicked as you are! Elphaba: What are you talking about? Boq: I'm talking about my life. The little that's left of it. I'm not free to leave Munchkinland, none of us are. Ever since she took power, she's been stripping the Munchkins of our rights... and we didn't have that many to begin with! And do you know why? Nessarose Reveals Herself In The Chair. Nessarose: To keep you here, with me. But none of that matters anymore. Look. Boq: To Elphaba. You did this for her? Nessarose: For both of us! Boq: Nessa, this changes everything. Oh, Nessa, I lost my heart to Glinda from the moment I first saw her. You know that. DID YOU THINK I'D LET YOU LEAVE ME HERE FLAT? Boq: Don't come any closer! YOU'RE GOING TO LOSE YOUR HEART TO ME, I TELL YOU! Boq: What is she doing?! Elphaba: No, Nessa, you're pronouncing the words all wrong! Nessarose: Boq! What is it? Boq: Gasps. My heart feels like it's... shrinking. Elphaba: I can't! You can't reverse a spell once it's been cast! Nessarose: So what do we do? Boq Falls Into Nessa's Empty Wheel Chair. Elphaba Wheels Him Behind The Closet. Nessarose: This is all your fault! If you hadn't shown me that horrendible book. Elphaba: I have to find another spell... it's the only thing that might work. She Goes Behind The Closet As Well. Elphaba Wheels The Chair Out, Which Is Not Facing The Audience And Is Seen Casting A Spell. JUST HER AND ME! THE WICKED WITCH OF THE EAST! Nessarose: Well... what about his heart? Boq: Where am I? What happened? He Sits Up, Squeaking. He Is Made Of Tin. Nessarose Screams. Boq: What is it, what's wrong? Nessarose: No, it wasn't me it was her! I tried to stop her. Boq Screams Uncontrollably And Runs Off. Nessarose: Boq, please listen! It was Elphaba! Boq! It was Elphaba!!! Wizard: Grabbing Her Broom. In The Terrible Wizard's Voice I knew you'd be back. In His Regular Voice Hear me out. I never meant to harm you. Elphaba: Well you have, you have harmed me. Wizard: I'm not calling anyone. The truth is I'm glad to see you again. It gets pretty lonely around here. And I know you must get lonely too. Elphaba: You don't know the first thing about me. Wizard: Oh, but I do. I do know you. I can't explain it exactly. You know what I mean? Elphaba, you've been so strong through all of this, aren't you tired of being the strong one? Wouldn't you like someone to take care of you? He Hands Her Back The Broom. Please, help me start again. Elphaba: Don't you think I wish I could? That I could go back to the time when I believed you really were wonderful? The Wonderful Wizard of Oz? Nobody believed in you more than I did. See, I never had a family of my own since I was always traveling, and I guess I just wanted to give the citizens of Oz everything. Elphaba: So you lied to them? Wizard: Only verbally. Besides, they were the lies they wanted to hear. Elphaba, where I come from we believe all sorts of things that aren't true... we call it history! INFACT, IT'S SO MUCH WHO I AM IT'S PART OF MY NAME! THERE'LL SUCH A WHOOPDEE DOO! THAT'S ALL TO DO WITH YOU! WONDERFUL, THEY'LL CALL YOU WONDERFUL! Elphaba: You set those Monkeys free. He Pulls A Switch On The Large Head And Monkeys Are Let Loose. They Fly Around The Theatre And Then Exit. Elphaba: Go! Fly! You're Free! Fly! Chistery, Chistery, you're free, isn't it wonderful?! Go, fly! She Makes Her Way To Another "Monkey" Covered By A Sheet. She Pulls Off The Cover, Revealing Dr. Dillamond. Elphaba: Doctor Dillamond, are you alright? Don't be afraid. It's me, Elphaba. Elphaba: Doctor, don't you remember me? Elphaba: No... We have nothing in common. I am nothing like you and I never will be and I will fight you until the day I die!!! The Wizard Climbs Into The Head And Dr. Dillamond Runs Offstage. Fiyero Runs In With His Men. Fiyero: Are you alright, your Ozness? Guard: There's a Goat on the lam, sir. Fiyero: Never mind all that. Fetch me some... some water. Fiyero: You heard me, as much as you can carry. Wizard: He Runs Out Of The Head. No! No! Fiyero: Don't make a sound, your Ozness, unless you want all your guests to know the truth about the Wonderful Wizard of Oz... Elphaba, I'll find Doctor Dillamond later, no get out of here. Elphaba: Fiyero, you frightened me. I thought, I though you might have changed. Fiyero: Glinda, you'd better go. Fiyero: Please, just go back to the ball. Glinda: Fiyero, have you misplaced your mind? What are you doing? Fiyero: I'm going with her. Elphaba: No, Glinda it wasn't like that! Fiyero: Actually, it was...but it wasn't...Elphaba, let's go... let's go! The Wizard Holds A Small Bottle With A Green Liquid. Wizard: Here, have a swig of this, it dulls the pain. Morrible: Oh, is it true? Your betrothed has taken her into custody? Wizard: Our new captain of the guard had other plans. Morrible: You mean she hasn't been captured? Morrible: Well, we'll just flush her out and force her to show herself. Morrible: What? What did she say? Glinda: Use her sister. Spread a rumor. Make her think her sister is in trouble and she will fly to her side... and you'll have her. Glinda: Now, if your Ozness will excuse me I have a slight headache, I think I'll lie down. Morrible: Yes, well...a rumor won't do it. Elphaba's too smart for that. AND SEE HOW BRIGHT WE SHINE! Elphaba: It's just... for the first time... I feel... wicked. Elphaba: Shh! Listen... Do you hear that? A Shriek Is Heard In The Distance. It sounds like somebody in pain. Fiyero: It's just the wind. Elphaba: The Siren Is Heard Again. My sister's in danger. Fiyero: What? How do you know? Elphaba: I don't know, I just do... Gasps. Fiyero: Elphaba what's wrong, what is it? Elphaba: This! Don't you see it? Fiyero: What do you mean? What do you see? Elphaba: It doesn't make any sense... It's a house but it's... it's flying through the sky? I have to go to Nessa! Fiyero: I'll come with you! Elphaba: No, you mustn't, it's too dangerous! Fiyero: Listen to me, listen! My family has a castle in Kiamo Ko. Now, no one is ever there except for the sentries who watch over it. We've never lived there. Elphaba: Where do you live? Fiyero: In the other castle... It's the perfect hiding place; tunnels, secret passageways. You'll be safe there. Elphaba: We will see each other again, won't we? Fiyero: Elphaba, we are going to be together always. You can see houses flying through the sky, can't you see that? They Embrace And Elphaba Runs Off. Glinda Enters. There Is A House In The Background. The Edge OF The Yellow Brick Road Can Be Seen. Glinda: That's right, you just take that one road, the whole time. Waves offstage. Oh, I hope they don't get lost. I'm so bad at giving directions. She sees the house, picks up flowers and lays them in front of the house. Oh, Nessa. Elphaba: What a touching display of grief. Glinda: I don't think we have anything further to say to one another. Elphaba: I wanted something to remember her by, and all that is left were those shoes, and now that wretched little farm girl has walked off with them. So I'd appreciate some time, alone, to say goodbye to my sister. 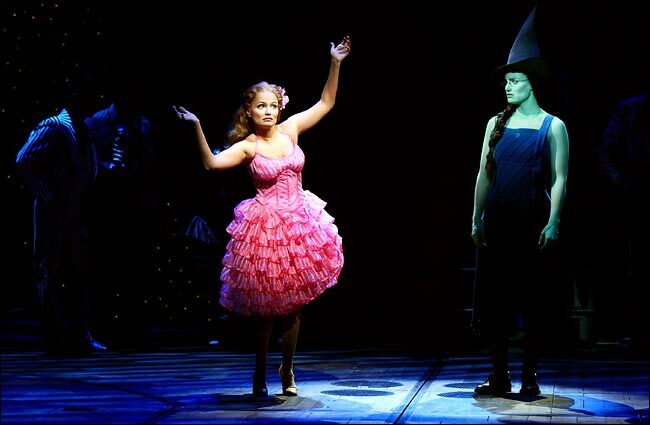 Glinda Backs Away As Elphaba Walks Toward The House. Glinda: Elphie... you mustn't blame yourself. It's dreadful, it is, to have a house fall on you, but accidents will happen. Elphaba: You call this an accident? Elphaba: Well, what do you call it? Glinda: Well... a regime change. Caused by a bizarre and unexpected twister of fate. Elphaba: You think cyclones just appear out of the blue? Elphaba: No, of course you never! You're too busy telling everyone how wonderful everything is! Glinda: Be encouraging! And what exactly have you been doing besides riding around on that filthy, old thing? Elphaba: Well, we can't all come and go by bubble. Who's invention was that, the Wizard's? Of course, even if it wasn't I'm sure he'd still take credit for it. Elphaba: Now wait just a clock tick! I know it may be difficult for that blissful, blonde brain of yours to comprehend that someone like him could actually choose someone like me! But it's happened... it's real. And you can wave that ridiculous wand all you want, you can't change it! He never belonged to you, he doesn't love you, and he never did! He loves me! Elphaba: Cackles. Feel better now? Elphaba: Good, so do I. She Slaps Glinda. Glinda Then Twirls Her Wand Skillfully And Elphaba Arms Herself With Her Broom. They Charge At Each Other And Then Drop Their "Weapons" And Beat Each Other Senselessly. Glinda Takes Elphaba's Hat Off Her Head And Begins To Whack Her With It. The Guards Run In. Guard: Halt! In the name of the Wizard! Elphaba: Stop! Let me go! Glinda: Let me go, I almost had her! Guard: Sorry it took us so long to get here, Miss. Elphaba: I can't believe you would sink this low! To use my sister's death as a trap to capture me?! Glinda: I never meant for this to happen! Elphie! Fiyero Swings In On A Rope. Fiyero: Let the green girl go! Glinda: Fiyero, how in Oz? Fiyero: I said let her go! Or explain to all Oz how the Wizard's guards watched while Glinda the Good was slain. Fiyero: I said, let her go. Elphaba: No, not without you. Glinda: Wait, what?! What are you doing? Stop it! In the name of goodness, stop! Don't you see? He wasn't going to harm me, he just... he just... he loves her. Fiyero: Glinda, I'm so sorry! Guard: Take him up to that field there! Put him on one of those poles until he tells us where the witch went. Glinda: No, don't hurt him! Please, don't hurt him! Fiyero!!!! LET HIM NEVER DIE, LET HIM NEVER DIE! AH! WHAT GOOD IS THIS CHANTING? I DON'T EVEN KNOW WHAT TRICK I OUGHT TO TRY! FIYERO WHERE ARE YOU?! ALREADY DEAD OR BLEEDING? ONE MORE DISASTER I CAN ADD TO MY GENEROUS SUPPLY! IS THAT ALL GOOD DEEDS ARE WHEN LOOKED AT WITH AN ICE COLD EYE? SURE, I MEANT WELL, WELL LOOK AT WHAT WELL MEANT DID! ALRIGHT, ENOUGH, SO BE IT! GO! AND HUNT HER AND FIND HER AND KILL HER! Vicious Woman: Good fortune, witch hunters! Rabid Man: Kill the witch! Boq: And, this is more than just a service to the Wizard. I have a personal score to settle with Elph... with the witch! Crowd Cheers. And I am not the only one. Looks Offstage. Oh, come on, you! Come out and tell them what she did to you in class that day. How you were just a cub and she cubnapped you. Glinda: No, no, that's not the way it happened! Madame, you've got to stop this, it's gone too far! Morrible: Oh, I think Elphaba can take care of herself. Glinda: Madame, something's been troubling me about Nessarose and that cyclone. Morrible: Oh yes... well, I guess it was just her time. Morrible: After A Pause. Now, you listen to me, Missy, you may have fooled the rest of Oz with this "aren't I good" routine, but you know better. You've wanted this since the beginning... and now you're getting what you wanted. So just smile and wave and shut up! Good fortune, good fortune witch hunters! Vicious Woman: Kill the witch! The Scene Changes To Kiamo Ko. Sounds of Dorothy Crying Are Heard Offstage. The Witch Storms On, Frustrated. Elphaba: Oh, for Oz's sake, stop crying!!! I can't listen to it anymore! Oh, you want to see your Aunt Em and your Uncle What's-his-name again?! Then get those shoes off your feet!!! Little brat... takes a dead woman's shoes; must have been raised in a barn! Chistery! Oh, Chistery, there you are. Where are the others? Chistery motions away. Chistery, please... if you don't at least try to keep speaking you will never... She Sees Glinda. Go away. Glinda: They're coming for you. Glinda: Let the little girl go, and that poor little dog... Dodo. Glinda: I know you don't want to hear this, but someone has to say it... You are out of control! I mean, come on! They're just shoes, let it go! Elphaba, you can't go on like this. Elphaba: I can do anything I want. I am the Wicked Witch of the West! Another monkey Brings Her A Letter. At last! What took you so long? She Reads It. What's this? Why are you bothering me with this? Elphaba: We've seen his face for the last time. Elphaba: You're right... It's time I surrender. Carries A Bucket. Glinda: Elphie.... Elphie, what is it? Elphaba: You can't be found here! You must go. Glinda: No! Elphie, I'll tell them everything. Elphaba: No! They'll only turn against you. Elphaba: I do! Promise me, promise me, you won't try to clear my name... promise. Glinda: Alright... I promise. But I don't understand. Elphaba: Here. Go on. Take this. Hands Her The Grimmerie. Elphaba: You're the only friend I've ever had. Glinda: And I've had so many friends... but only one that mattered. Elphaba: You have to hide. No one can know you were here. Hide yourself! Boq and Other Witch Hunters Run In. You Can See The Silhouette Of The Action Happening Behind The Scrim. Glinda Is Downstage Watching The Action Take Place. The Mob Surrounds The Witch And She Melts With A Scream The Mob Leaves And Glinda Comes Out From Hiding. She Moves Near The Scrim. Glinda: Elphie? Elphie? Chistery opens the scrim, where just Elphaba's hat and the green bottle remain. Glinda cries, and grabs the had, holding it against her. Chistery: Handing Her The Bottle. Miss, Miss Glinda. The Next Scene Opens In the Emerald City With The Wizard & Mme. Morrible. Morrible: Well, I don't know why you're so despondiary, I thought it went quite well! They seem thrilled to shreds with their brains and their hearts, and this and that.... Glinda Enters. Oh, Miss Glinda! I thought you'd be out festivating. Glinda: This was Elphaba's. Holding Out The Bottle. Wizard: What's that you say? Glinda: It was a keepsake. It was her mother's. She told me so herself. I've only seen a little, green bottle like this one other time. It was right here, in this very room. You offered me a drink from it. Lover's Song Played In Background. Morrible: So that was it. That's why she had such powers! She was a child of both worlds! Glinda: I want you to leave Oz. I'll make the pronouncement myself: that the strains of wizardship have been too much for you and you are taking an indefinite leave of absence! Did you hear what I said?! Glinda: You'd better go get your balloon ready. Glinda: Guards! Madame, have you ever considered how you'd fare in captivity? Glinda: Articulated. Captivity... prison! Personally, I don't think you'll hold up very well. My professional opinion is that you do not have what it takes. I hope you prove me wrong. I doubt you will. Take her away! The Scarecrow (Fiyero) Walks On Stage. He Bends Down & Knocks On A Trap Door In The Floor. He Opens The Door & Elphaba Climbs Out. Elphaba: Fiyero! I thought you'd never get here. She Touches His Straw Face. Fiyero: Go ahead, touch, I don't mind. Ah, you did the best you could. You saved my life. Fiyero: You don't have to lie to me. Elphaba: It's not lying... its looking at things another way. NOW AT LAST SHE'S DEAD AND GONE! Glinda: Fellow Ozians, friends, we have been through a frightening time. There will be other times and other things that frighten us. But if you let me, I'd like to try to help. I'd like to try to be... Glinda the Good. Fiyero: It's time to go. Elphaba: We can never come back to Oz, can we? Elphaba: Glinda could know that we're alive. Fiyero: She can't know, not if we want to be safe. No one can ever know.